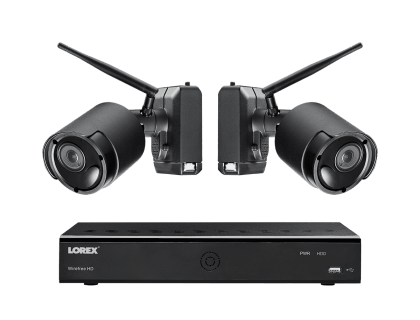 Learn more about the Lorex Wireless System with 2 Rechargeable Wire Free Cameras. Find pricing and answers to common questions. The Lorex Wireless System with 2 Rechargeable Wire Free Cameras is a Lorex monitoring system that is quick to install, easy to access remotely, and designed to withstand harsh weather. It comes with a security grade DVR, two battery-operated, wireless cameras equipped with microphones and speakers, and a 1TB hard drive. DVR can support up to 6 wire-free cameras. 2 × 1080p wire-free security cameras. Pros: Long distance wireless range. No monthly fees. Cons: Short recording time. The user manual needs more detail. Bottomline: The Lorex Wireless System with 2 Rechargeable Wire Free Cameras is an affordable, hassle-free option, with a wide range of features. What are some alternatives to the Lorex Wireless System with 2 Rechargeable Wire Free Cameras? Where can I buy the Lorex Wireless System with 2 Rechargeable Wire Free Cameras security camera system? The Lorex Wireless System with 2 Rechargeable Wire Free Cameras is available on Amazon and on the Lorex website. Does the Lorex Wireless System with 2 Rechargeable Wire Free Cameras work at night? Yes, the wireless cameras have a night vision range of up to 150 ft.
Can the Lorex Wireless System with 2 Rechargeable Wire Free Cameras be used in any weather? Yes, the cameras are both dust and water resistant and can operate in temperatures of between -4 and 113˚F.